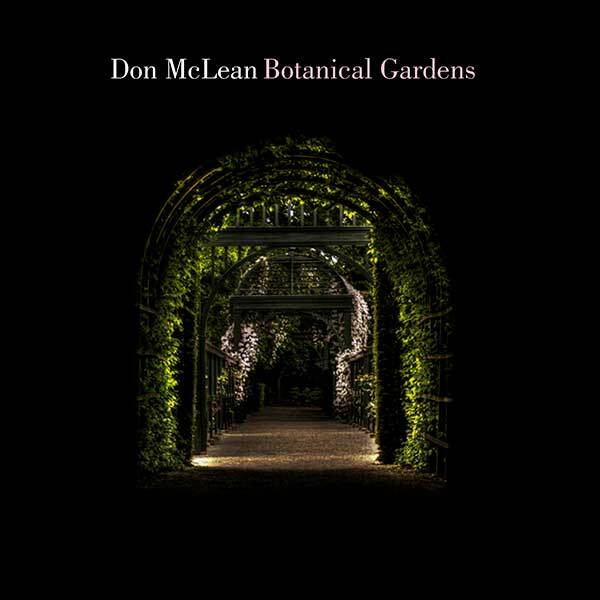 DON MCLEAN TO RELEASE NEW ALBUM BOTANICAL GARDENS MARCH 23 | 2911 Enterprises, Inc.
Iconic American singer, songwriter and performer Don McLean is set to release his new album Botanical Gardens on March 23rd 2018 via BMG. With over 40 gold and platinum records worldwide, his prowess for writing timeless songs is once again captured on Botanical Gardens, as he artfully weaves country, Americana, folk, and boot stomping rock for an eclectic, yet American sound that he is known for. Intimacy can be found at the heart of this record, with Don penning personal numbers looking back on a life well-lived, as well as his observations on youth and love. Recording at Watershed Studios in Nashville also allowed a different kind of intimacy for Don and his band, as they were made to “play close and feel the music”, resulting in a raw, yet tight sound throughout. In nearly 50 years, Don’s songs have become an iconic staple of American music. His music has been performed by artists as diverse as Elvis Presley, Madonna, Fred Astaire, Drake, James Blake, Chet Atkins, Garth Brooks, Weird Al Yankovic, George Michael, Josh Groban, Coolio and Ed Sheeran. His biggest hit, “American Pie,” was recently recognized with high honors by BMI for achieving five (5) Million-Air certified airplay awards, along with “Vincent (Starry, Starry Night)” achieving three (3) Million-Air certified airplay awards. “American Pie” also has been inducted into the Grammy Hall of Fame, and is also included in the archive at the Library of Congress. Don McLean was inducted in the Songwriters Hall of Fame in 2004. Feb 03 Deadwood Mountain Grand Event Center – Deadwood, S.D. Feb 16 Space Coast Daily Park – Viera, Fla.
Feb 23 Southwest Florida Event Center – Bonita Springs, Fla.
Mar 02 Mesa Arts Center Ikeda Theater – Mesa, Ariz.
Mar 03 Saban Theatre – Beverly Hills, Calif.
Mar 10 Cascade Theatre – Redding, Calif.
Mar 23 City Winery – New York, N.Y.
Apr 13 Greenwich Odeum – East Greenwich, R.I.
Apr 14 The Birchmere – Alexandria, Va.
May 12 Capitol Theatre – Clearwater, Fla.
For more information on Don McLean visit his website, Facebook, Twitter or Instagram. A New York native, Don McLean is one of the most revered and respected songwriters in American history. After paying his dues in the New York club scene in the late ‘60s, he went on to score mega-hits like “American Pie,” “Vincent (Starry, Starry Night),” “Castles in the Air” and many more. In 2004, McLean was inducted into the Songwriters Hall of Fame by country superstar Garth Brooks. “American Pie” has brought great happiness and hope to millions of people through the years and continues to be honored for its success. In 2000, the song was named one of the Top 5 Songs of the 20th Century by the RIAA and in 2002 was inducted into the Grammy Hall of Fame. 2017 brought a huge honor when the iconic song was inducted into the Library of Congress’ National Recording Registry, joining less than 500 works including “Somewhere Over the Rainbow,” classical music compositions, infamous live broadcasts and similar recordings. McLean continues to tour both North America and abroad bringing a mix of his classic hits with an array of new works, some of which will be released in 2018.